No sooner had I returned from the snowy Alps was I on another plane for the next mission to Port Harcourt Nigeria ( My Mother's home City- HURRAH) as International PR Agent for the ION Film Festival www.ionfilmfestival.com thanks to Caterina Bertolossi & the OMCOMM Team. 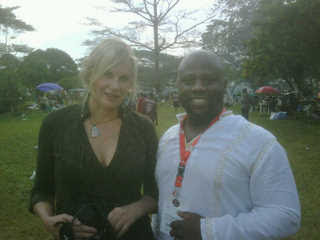 To bring to light the diversity and culture nutured in PH whilst enhancing the link of Nollywood, Hollywood & Bollywood. The cause continues and I was very proud to see what my Nation is capable of delivering!!! There will always be bad press but as long as we keep creating in Film & Entertainment as a whole attractive events and positive workshops for our people we shall prevail!!!!! The countdown began 9th December to one of the most hotly anticipated events in the Film Festival Calendar, The ION International Film Festival, held in Port Harcourt Nigeria 9-12th December 2009. Everything happened thick and fast - all the special events taking place, forums, seminars, previews, screenings, bringing magic, mystery and fairytales to life together with the greatest entertainment available at this year’s event which brought an energy unforeseen for many years in the region. Most Guests, Directors, Actors, Press and Participants, came from all over the globe including Kenya, South Africa, Zimbabwe , Tanzania, other Nigerian States, regions and tribes for example Lagos / Ibos / Hausa’s Kanowood, other countries like India, Pakistan, Indonesia, Iran, Hong Kong, European Countries France, Germany and the UK, USA & South America) - arrived in the pores cleansing heat of Port Harcourt on Wednesday 9th December, and were welcomed by transportation and security. Most were based at Le Meridien Hotel. After checking in and registering, the guests were treated to a sumptuous dinner hosted by His Excellency Rt Hon. Chibuike Rotimi Amaechi at the Government House. • Seminars included - ENTERTAINMENT BUSINESS SESSION 1 : FINANCING - with a Panel that included Parminder Vir OBE (Financing), Sandeep Bhargava (Studio 18), Zeb Ejiro (Filmmaker), Chris Roland (Zenhq), Madhu Mantena (The Big Bang Co), Aon Albert G.Ruben, First Bank of Nigeria and BGL Investment Bankers. Evening – Pras from Fugees & Giancarlo Esposito arrive ! – World Class! Any quotes at the event: Pras – about being in Nigeria and how everyone has been so welcoming! • 12PM Silverbird Cinema Complex Films – World Premiere of “Gospel Hill” By Giancarlo Esposito ( USA) , starring HIMSELF, Angela Bassett and Danny Glover – 1 1/2HRS – Discussion with Director and Giancarlo took a lot of workshops and discussions which should be recognized as well. • PRESS CONFERENCE AT SILVERBIRD which was moderated by Baba Epega including the Bollywood Stars Adnan Siddiqui/ Mesumeh Makhija /Bollywood Directors Sandeep Bhangava/ Nollywood Stars and Directors (Sam Dede / Lancelot Oduwa/Head of Censorship) / Parminder Vir/ Chris Roland with the World Press – The discussion centered on Piracy / How to obtain Investment and how Nigerian Film can interact with Hollywood/Bollywood. Seminars included - PRODUCER'S CIRCLE - included pitching, TV Formats, mutual co-productions etc. ACTOR'S STUDIO - WITH HOLLWOOD STAR - Gian Carlo Esposito - Nandana Sen FROM BOLLYWOOD and Sam Dede from NOLLYWOOD - HOLLYWOOD , NOLLYWOOD, BOLLYWOOD - The Circle is complete. • Pras of the Fugees ( Pras & Nneka did a rendition of “Killing Me Softly” and completely smashed it !